Dell's Mini Inspiron 9 netbook due tomorrow? 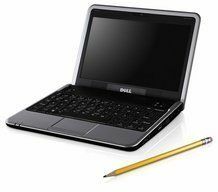 We gave you information back in August about Dell's new range of as-yet-unreleased notebooks, called the Mini Inspiron 9. While a launch date was rumoured to be a few weeks back (when the netbook went under the title Mini Inspiron 910) this never actually materialised. However, web-whispers are pointing to an official release tomorrow, after an email was leaked from box.net, where it said storage on its site will be bundled with the netbook. This was then, according to ZDnet, confirmed by the Wall Street Journal. With about as much information leaked about the product that can possible be leaked – SSDs up to 16GB, carry 800MHz of memory, Intel Atom processor, comes with either Windows XP or Ubuntu 8.04 – all we are waiting for now is for a launch, so we can see if it truly will be the Eee killer Dell claims it to be.